A grant from the Hansen Foundation helped with historical preservation and reenactment. Commun ity members re-enacted a famous scene that has been used on signs, post cards, and the National Park Service educational trailer. The scene depicts the stage coach arriving and friends and family waiting for their expected passenger. 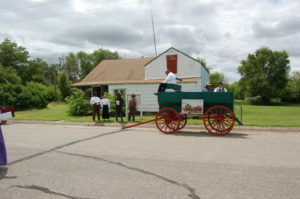 This was a living history re-enactment with a period wagon and driver, performed on the street where the stage coach would have arrived. Everyone played their part with discussions with one another as the ‘stage coach’ arrived and showing their excitement as it came to a stop in front of the building. The interaction between the driver and the postmaster, as well as the passengers and their greeted family and business associates proved to be very realistic, educational and entertaining for those watching. People attended from KC, Wichita, Denver, and Omaha. In addition, the grant helped process nearly 1500 historical photos into catalogs to help visitors find historical materials available at the museum. The museum now has a comprehensive collection of all generated museum photos of past events. The copies are in a set of binders that are now accessible to the general public and for use by writers, publishers, film makers, the National Park Service, and by the museum volunteers and staff when doing exhibits, brochures, etc.